Yesterday, a visitor to this website asked me how, exactly, I handle shooting High Dynamic Range photography with the X100, particularly when the dynamic range of light on the scene exceeds what a normal five-shot bracket set (+2, +1, 0, -1 and -2) would be able to cover. More specifically, the reader wanted to know if it was possible to shoot a seven-shot braket set of photos (+3, +2, +1, 0, -1, -3 and -3) with the X100. Answer: Yes, absolutely. In brief, you’ll use the following steps (listed under today’s photo) to do this, and I’ve included a short video tutorial under today’s photograph to walk you through this. Let me know if this is useful. 4. Now go to the top of the camera and dial the EV down two stops from 0 to -2. 5. Press the shutter release (this now gives you three exposures (-3, -2 and -1 EV). 6. Now go to the top of the camera and dial the EV up four stops from -2 to +2. 7. Press the shutter release (this now give you three exposures (+1, +2 and +3). 8. Once you’ve done the above, you will have a total of 7 brackets (-3, -2, -1, 0, +1, +2 and +3). Wayne Frost – Fuji camera ought to pick up your image above of the X100, that would make a great image for an ad. Brian Donegan – Excellent tutorial sir. What’s the red knob on the shutter release in the vid? Jacques – Brian. That little red button is a “soft release”. Jacques – Heh heh! Thanks, Wayne. That’s a wonderful compliment! Carter – Yeah, yeah, yeah…X100, blah, blah! What is that AWESOME bag it’s resting on! 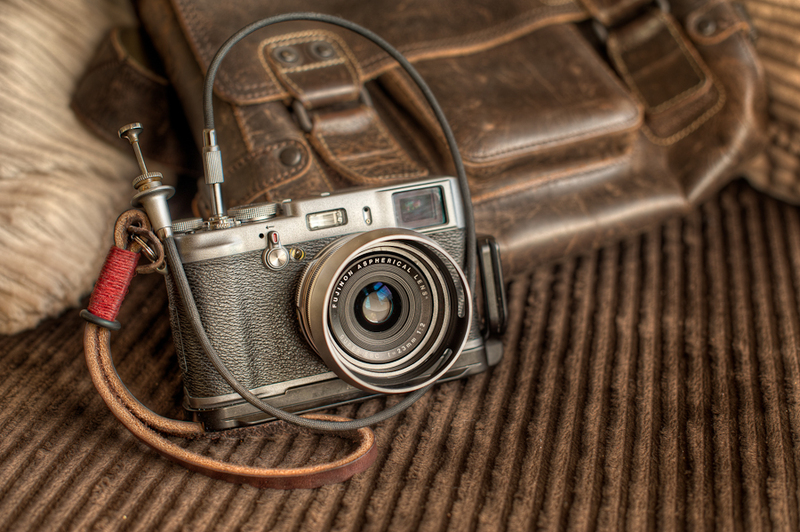 J/K re: the X100, of course….just have to hate since I don’t have $1200 at the moment! Jacques – Hey there, Carter! Don’t hate the playa… hate the… Oh, wrong movie. Anyway, that bag is one I picked up in Germany in Cologne from a company called Aunts & Uncles. Love that bag. Fits my iPad 2, perfectly, and still has room for the X100 with the lens hood on, a cable release, a B&W 10-stop filter, a lens pen, a micro fibre cloth, three extra batteries for the X100, an iPhone, a Moleskine agenda, a couple of pens, a bamboo iPad stylus and the camera connection kit to download images directly from the X100 to the iPad. I have it with me ALWAYS! Jacques – Wouldn’t have found it without you. Thanks, Frank! Craig – Thanks for the tutorial!! Where, oh where, did you find that strap?? Thomas – Thank you for these instructions, I have used this page to capture some awesome shots using my X100 for my X100 Blog. I have found the the X100 to produce great HDR shots, even hand held. Hemanshu Narsana – Seriously.. The stop is beautiful. Where did you get it? Barry – Great article on the HDR with x100. Is of great help to me. Can you tell me what the model/brand of the cable release you use? Jacques – Thanks, Barry. That’s an old Canon cable release I found in sitting in a odds-and-ends bin in a Camera shop in Redding, California. It was clearly made back in the days of al metal and cloth cable construction because it is a vey solidly build release. Hope that helps.